Streamline your most important processes with Laserfiche ECM. Reduce risk, increase compliance, and improve visibility of your documents and files. Laserfiche allows you to take your existing paper-driven processes, and automate them, using proven, easy-to-implement tools. "Going paperless" isn't just scanning your documents and sticking them in a file on your server. We work with you to understand your company's processes, and identify pain points and target areas for automation. Invoices can be scanned or imported from your email, and data such as Invoice Number, Date, Vendor captured at the time of scan. 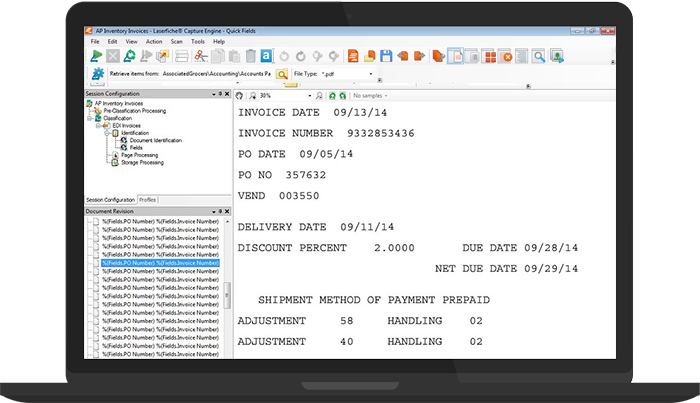 Laserfiche lets you use this data to easily find your invoices, purchase orders and packing slips. Using Workflow, you can create email notifications and automate payment and other processes associated with Accounts Payable. Learn how Steinhafels, Inc. improved the efficiency of its HR department amid a growing workforce, and a paper-driven HR onboarding process. Employment paperwork, benefits enrollment, and even the hiring process can take place online, from anywhere, making your HR team more efficient. © Copyright 2018 - DocUnited Imaging, LLC. All rights reserved.